New Delhi : The Filmfare Magazine has always put its best foot forward as far as the mien and demeanor of its cover-stars are concerned. However, this time the April issue of the magazine has amassed some style icons of Bollywood, all together in one frame. Many colours in the same frame. Where Kareena Kapoor is looking hot in yellow, Sonam Kapoor in blue likewise Alia Bhatt is looking a chic in Pink. Lucky chap Akshay Kumar is flaunting his fate, sitting surrounded by hot leading girls of Bollywood. 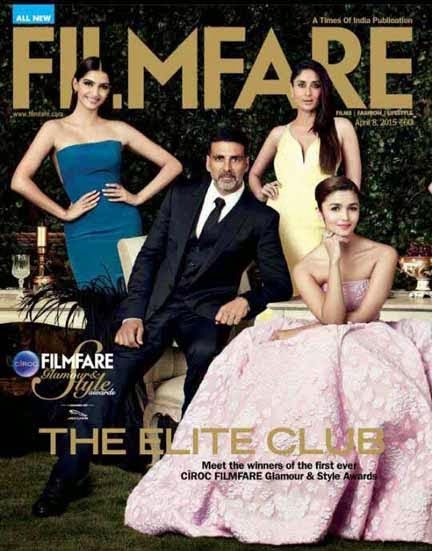 Well the April issue of Filmfare magazine is going to be the most awaited one, which has features winners of CIRCOC Filmfare Glamour & Style Awards.